1. 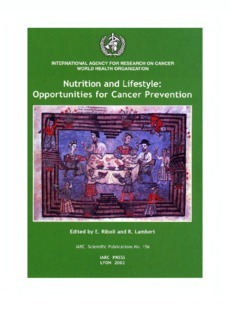 Collaboration with the Commonwealth and state health departments, to develop and implement a national public education programme to increase knowledge of the links between cancer and diet, and to change dietary behaviours. 2. Collaboration with state and territory members of The Cancer Council, and other nongovemment health bodies and consumer agencies, to actively advocate for public policy supportive of cancer-preventing diets. 3. Supporting and promoting research into the relationship between nutrition and cancer and how to change diet-related behaviours. The paper describes recent advances in the implementation of these strategies in Australia.